The foreland basins north and south of the Alpine mountain range feature oil and gas occurrences in different stratigraphic levels of the basin-fill and its base. These hydrocarbon deposits evolved from marine sediments which, due to warm climate during formation, were rich in microorganisms. Oil and gas were formed by thermal maturation of organic matter under high temperatures and pressure caused by subsidence and overburden. Petroleum and associated gas of the deeper deposits in the eastern Molasse basin were developed at temperatures up to 270 °C under high overburden pressure induced by the weight load of the advancing Alpine units. The hydrocarbons migrated northwards within porous layers, e.g. sandstones, and accumulated in structural traps, predominantly caused by faults. The thermogenetic oil and gas deposits of the deeper Molasse basin formed about 35m years ago underneath the Alpine orogen thrusting northward. The generation of the natural gas at shallower levels of the Austrian and Bavarian Foreland Molasse took place under lower overburden pressure approximately 20m years ago, in the foredeep in front of the young Alpine orogen, successively filled up with the debris washed in from the rising mountain ranges. Rapid sedimentation of large masses and a reducing marine environment during basin subsidence enhanced bacterial activity converting the dispersed organic material into biogenic gas. The oil and gas discoveries of the Molasse basin have been subject to an enhanced exploitation beginning in the mid-1950s. 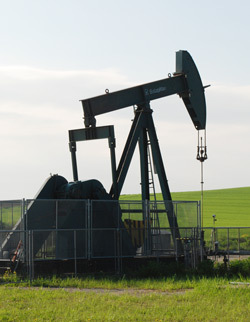 Many of the hydrocarbon deposits are economically depleted and abandoned today. However, in some fields in the Bavarian and particularly the Austrian parts of the Molasse basin oil and gas production continues, with an annual yield of ca. 32,000 t of crude oil and 7.5m m3 natural gas in Bavaria (2012), and about 100,000 t crude oil and 235m m3 natural gas in Austria (2010). In the Swiss part of the Molasse Basin only one gas discovery exists which generated 75m m3 natural gas between 1985 and 1994. The Po Basin petroleum and gas deposits occur in geological settings similar to the Molasse Basin, but emerged as a result of two concurrent orogenic thrusts: the south-verging Alpine thrust sheets in the north or the north-verging Apenninic thrust sheets in the south of the basin. Source rocks of the hydrocarbon occurrences are Middle Triassic carbonates rich in organic matter, formed about 250m years ago, and Tertiary marine sediments deposited approximately 30m to 20m years ago under molasse-typic conditions. The conversion of dispersed organic matter into hydrocarbon deposits (maturation, migration and trapping) followed the same conditions as in the Molasse Basin, thus three types of hydrocarbon deposits can be distinguished: biogenetic gas in the upper Tertiary sediments (most abundant type of deposit), thermogenetic oil and gas at deeper Tertiary levels and termogenetic oil and gas of the Mesozoic, accumulated more or less in-situ. First exploratory wells in the Po Plain date back to the early 20th century. Exploration and development of oil and gas fields strongly intensified from the mid-1940s to the 1960s and extended offshore to the adjacent Adriatic Sea. Overall 67 gas fields and 9 oil (+ gas) fields were discovered in the Po Basin. Nowadays all but one of the hydrocarbon discoveries are economically depleted, nine are reused for natural gas storage. Neither of the Alpine Foreland Basins reaches into Slovenia, but small oil and gas deposits have been discovered in the Slovenian part of molasse-like Pannonian Basin. From 1942 until today around 670,000 t of crude oil and 440m m3 of natural gas were produced. These discoveries are now almost depleted, thus shifting the focus of exploration towards unconventional targets. After decades of investigation resulting in more than 250 discoveries the Alpine Foreland Basins were considered mature in terms of hydrocarbon exploration by the end of the 20th century most oil and gas fields were regarded as economically depleted, new large discoveries were unlikely. However, technical progress and geological models based on new seismic interpretation generated new prospects and improved exploration efficiency. Thus, especially operators currently active in the western and central sectors of the Molasse Basin are studying the feasibility of exploiting conventional and unconventional targets, both, within the basin-fill as well as in the bedrock of the Molasse basin. GeoMol is designed to assist in considering the oil- and gas-potentials contextually with other conceivably competing geopotentials and to balance against possible geogenic risks.